Plant Power Day is back on 7th March 2019, and dairy alternative brand Alpro is calling on the nation to ‘Go Big on Plants’ and make plant-based foods the star of the show for the day. It’s as simple as bringing veggies, fruits, whole grains, pulses, legumes, nuts and seeds from the side of the plate to front and centre – because this way of eating is good for us, and good for our planet… And it only takes one day to make a difference! Did you know that if you ‘Go Big on Plants’ for just one day, you can save 1,500 litres of water? That’s the equivalent to two whole weeks of showers! You could also reduce your carbon footprint by 2kg – that’s the energy needed to make 1,064 cups of tea! Topped with Alpro Plain Unsweetened No Sugars Big Pot, this Mexican feast is completely plant powered. Cover the red onion with boiling hot water and leave for 5 mins. Drain the water and pat dry. Place in a small bowl, season well with salt and pepper and add the juice of 1 lime. Leave to macerate whilst you prepare the remaining ingredients. Brush the flour tortillas with oil lightly. Use the underside of a muffin tray to shape the tortillas into a bowl pushing the middle section of each into the gaps to hold in place. Bake in the oven for 6-8 minutes or until golden brown and crisped. Mix together the beans, sweetcorn, sliced radish, roasted red pepper, coriander, olive oil and juice of 1 lime. Season well with salt and pepper. Marble the chipotle paste into the Alpro Plain Unsweetened Big Pot. 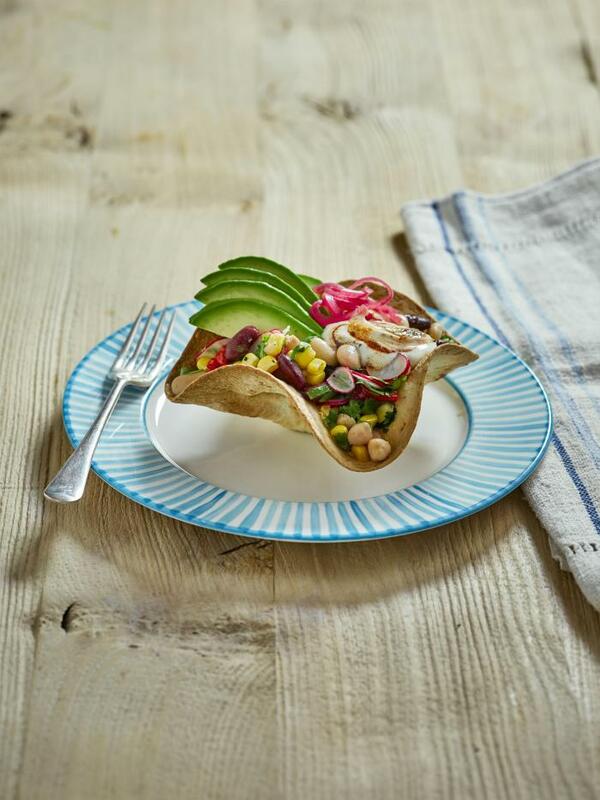 Spoon the beans into the tortilla bowls, top with the red onions, sliced avocado and a big dollop of the sauce. Go green or go home with this plant-packed Thai curry. Spinach? Check. Spring onions? Check. Peas? Check. And don’t forget the Alpro Coconut Unsweetened drink for that creamy finish. Add the spinach, spring onion tops, coriander (leaves and stems), green curry paste, soya sauce or tamari and Alpro Coconut Unsweetened drink to a blender or food processor and blend until smooth. In a large frying pan, sauté the baby corn for 2-3 minutes over a medium heat until starting to colour, add in the tomatoes and sauté for 30 seconds. Finely chop the white parts of the spring onion. Add the lime juice to the curry and season to taste. Sprinkle over the spring onions and serve. Serve with brown or white rice. 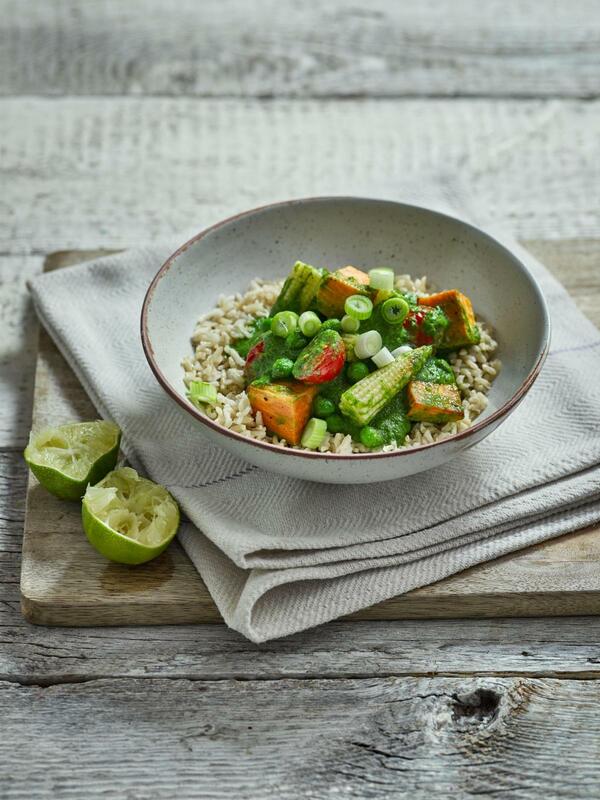 For more information on Plant Power Day visit our website here, and to discover more delicious plant-based recipes for the big day take a look here.